Yamashita has taken another revolutionary step! The patented Warm Jacket Technology that rocked the world of Egi Squid fishing from the shore is applied to the Toto Sutte R which basically it's a technology that increases the lure's temperature to the level of a real live bait. Squids (scientifically proven) detect temperature increase. Now bottom squid fishing from the boat can accomodate the unique benefits of the Warm Jacket. Unique thermo-storage cloth called the 'warm jacket'. The cloth reacts to light (any form of light: sunlight or artificial light) and will maintain its temperature for longer than traditional cloths. 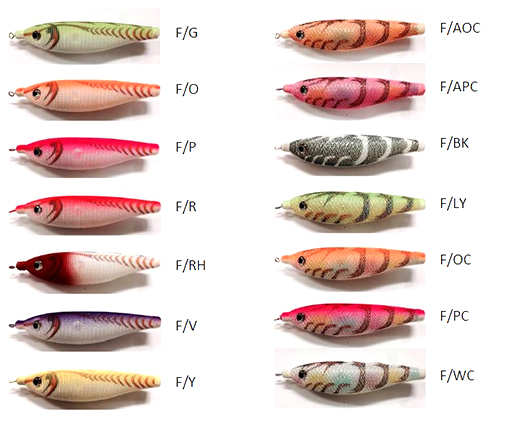 With the capacity to hold heat similar to natural fish the Yamashita Egi Oh Q Live jigs are more successful in attracting squid’s interest since squid can recognize temperature variations when hunting prey. The new material is called 'Tactywarm' which is weaved with a unique thread that is able to change light into heat. It can absorb light from sunlight to artificial light, changing it into thermo energy about 0.5 degree Celsius to 1 degree Celsius warmer in the water, depending on the conditions.The Egi Oh Q Live has an uncompromised balance. The unique aerodynamic body design, the slim nose and the specially designed sinker makes this jig on of the best in terms of casting distance. Toto Sutte R is equipped with internal sinkers which moves the center of balance forward that helps the lure sink fast - nose down. However once it sinks the center of balance goes back in its place so the lure is horizontally stabilazed. This feauture also provides a more fast natural reaction towards the jerk of the angler. The sinker createsrattle sound that stimulate the squids to attack. The cloth material is similar natural scale and on certain color variations there are also equipped with flash effect color material that reflects all available light. The lures also feature a strong fluorescent glow that definately attracts the squid during bottom fishing.